The area of redevelopment is the southeast corner of the block at the intersection of Crystal Drive and 23rd Street. 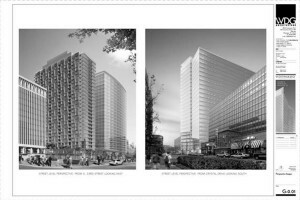 The site is on the east side of Jefferson Davis Highway in Crystal City, on the block bounded by 20th Street to the north, Crystal Drive to the east, 23rd Street to the south and Clark-Bell Street to the west. The site is within Block M in the Crystal City Sector Plan. There will be a public review process to include review of a Crystal City Block Plan submission by the Long Range Planning Committee (LRPC) followed by review of a site plan amendment submission by the Site Plan Review Committee (SPRC) for this development proposal. The applicant, Vornado/Charles E. Smith, rezoning and site plan amendment to SP #11, which includes the Crystal Plaza V site at 223 23rd St. Develop a 3,000-square-foot pocket park. This development will be included in the review of the Crystal City Block Plan (CCBP) submission to the Long Range Planning Committee (LRPC). A complete list of LRPC meeting schedules, reports and presentations are available on the LRPC website.